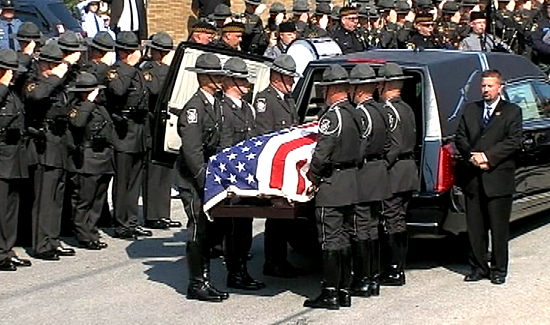 LATROBE, Pa. — A large contingent of law enforcement lined the streets of Latrobe on Tuesday morning as a funeral procession was held for Pennsylvania State Police Trooper Michael P. Stewart, who died in an on-duty car accident last week. Drums and bagpipes were played while police escorted the hearse from Lopatich Funeral Home to Holy Family Church, where Stewart’s casket, draped in an American flag, was carried inside by fellow troopers for the funeral service. A private burial followed at Unity Cemetery. Stewart’s partner, Trooper Travis November, walked with the help of crutches as he attended the funeral, still recovering from his injuries after last week’s crash. Two Texas troopers gave a flag that flew over the state Capitol to Stewart’s family. “We’re all state troopers. When one of us falls, we all fall,” Texas Trooper Joshua Sneed said. On Monday, family and friends paid their respects to the 26-year-old Stewart, whose patrol vehicle collided with a garbage truck on Route 711 in Ligonier Township early Friday morning. The cause of the fatal crash remains under investigation. Those who loved Stewart remembered the man who always made them laugh. Kearney met Stewart when the Latrobe native started working at Steelers training camp at age 15. He would have turned 27 this week.